Today is my first day back at school. I’m always a little nervous on this day, wondering who will be in my class and if we’ll all get along. Spending six hours a day with twenty people in one room all year long can be a great year or a very bad year depending on the mix of people! 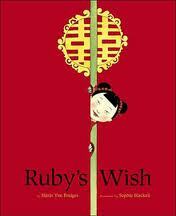 In thinking about the beginning of the year, I’m reminded of the picture book, RUBY’S WISH by Shirin Yim Bridges. In thisstory, Bridges retells the journey of how her grandmother became one of the first woman to attend university in China. I love Ruby’s determination and love for learning that shines through in these pages. And Sophie Blackall does such a striking job with the illustrations, pulling out that common theme of the color red, which is Ruby’s favorite color. When I read this story to my students, I also tie it into family history and what life was like for our grandparents and where our grandparents came from. A great link for activities to support this is here. You’re never too old to learn a new language. Here’s a link to create flash cards to learn Chinese. And have you ever wondered what your name would look like in Chinese? Check out this link. If you look to the left, you’ll see my name in Chinese. Pretty cool, huh? Now if only I could write it that well. Good luck on your first day with the kiddos. May you have a wonderful batch of curious minds! Hope your first day was a good one with many, many more to come! Ruby’s Wish sounds like a wonderful story. I love when books can be used in so many different ways. Good luck with the first day back at school! And thanks for the book recommendation! I hope your first day was full of great surprises. We start tomorrow. And yes, you’re never too old to learn a new language … this year it’s going to be Spanish for us. Hopefully the first days at school went well. I guess your students were also a little nervous, wondering who will be their teacher. But now they are happy. Creative idea for the cover, where the girl opens the cover, showing her head.